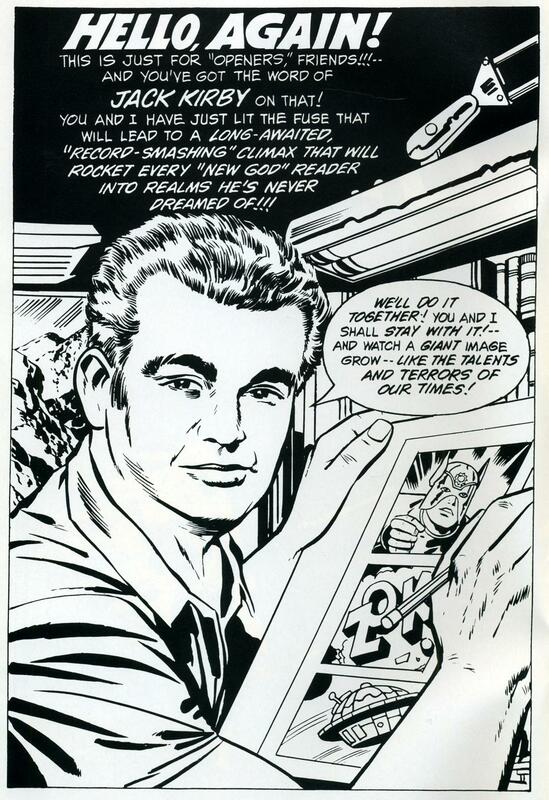 Maybe you'd like to see Jack Kirby's words come to life? I like what they did in the fun video that you can investigate for yourself right over here. I was intrigued by The Time Tunnel back in the late 1960s. The show lasted just one season and every week the main characters would walk into the spiral tunnel you see above and be transported through time to some other era. I have no recollection of why they were time-traveling or what the point of the show was but I own the complete series on DVD and I'll be dipping into those discs in my (ha ha) spare time one of these days. I do remember that I liked the concept of the show, though. Fast forward to 2016. Last week was the premiere of DC's Legends of Tomorrow, the latest show from the team behind Arrow and The Flash. 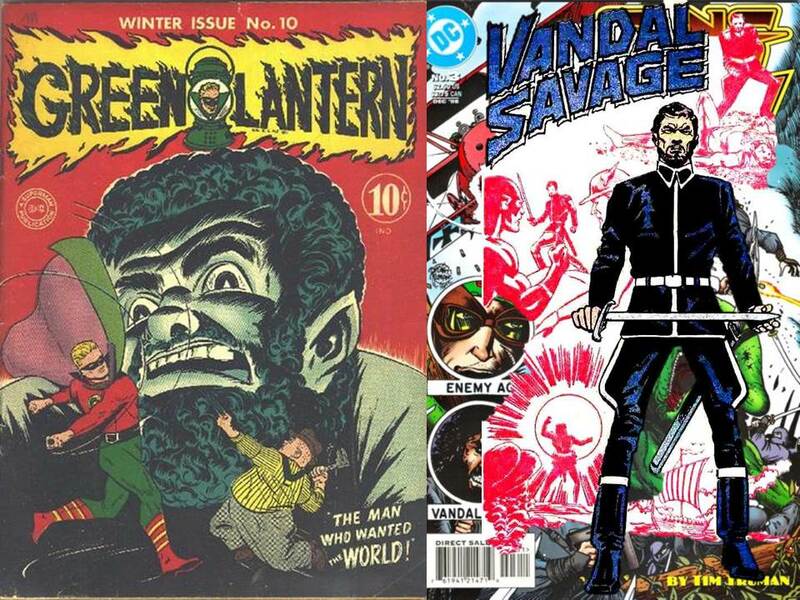 As in The Time Tunnel the characters will time-travel to a different era every episode, but with a definite purpose (namely, to neutralize the immortal Vandal Savage before he (gulp) destroys all life on earth). The cast is familiar already, each of the characters having sprouted previously on Arrow or The Flash, and I like what I see. 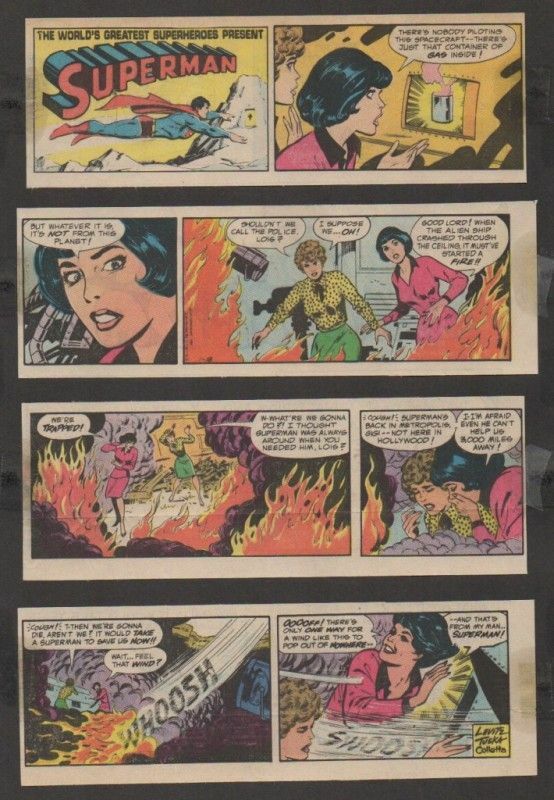 Paul Kupperberg was tweeting a few weeks ago about how the Superman newspaper strip would be ending. This piqued my curiosity because I hadn't been aware that there currently was any such strip. It turns out that Mr. K was referring to the strip that ended in 1985. He has been chronologically re-presenting the strip one week at a time on his website and he was indicating that he was reaching the end of the chronology. That strip (known for most of its run as The World's Greatest Superheroes) was drawn by George Tuska. I doubt that any comics fan has ever proclaimed Mr. Tuska to be his favorite artist, but I was a fan of the gentleman's artwork (and I especially enjoyed when he frequently drew his villains with buckteeth). Do you realize that George Tuska's comics resume dates all the way back to 1941 and Captain Marvel Adventures #2? I saw a student reading this book in the hallway just now. I have no interest in reading it myself. If you like comics, read comics. Right? 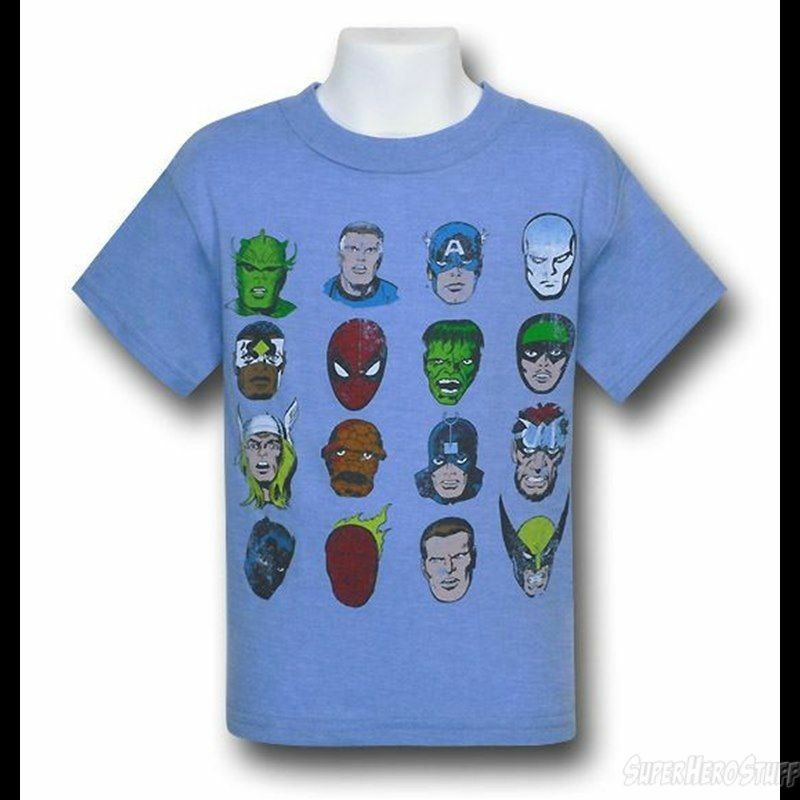 I feel very comfortable saying that thirteen of the sixteen heads on this t-shirt come from artwork drawn by Jack Kirby. Do you agree? 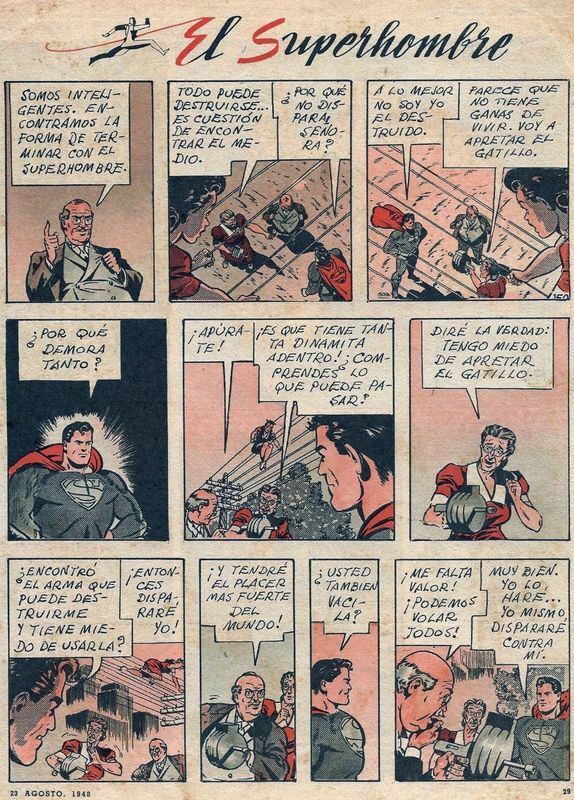 I think it's fun to look at this page from a 1948 Argentinian children's magazine that reprints a page of an American Superman story. I see that the one who lettered the translation into Spanish had not yet come upon an Ames lettering device (my own lettering got so much better when I bought one of those devices in my teens). I watched Mad Max: Fury Road yesterday and thought it was fabulous! I saw The Road Warrior when it came out in 1981 and liked it but I can't imagine it was as excellent as this follow-up. No film in recent memory has had color this beautiful and oh, those crazy cars! I wait for the credits after a movie that impresses me and I was amazed to see Brendan McCarthy listed as a co-writer with director George Miller. 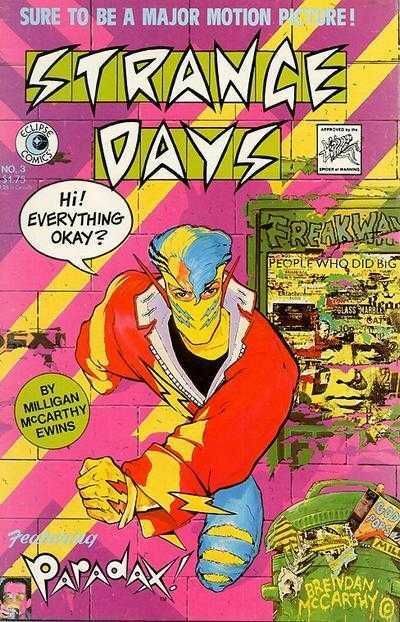 Mr. McCarthy's name will ring a bell since he was involved with the 1990s revamp of Steve Ditko's Shade, The Changing Man. 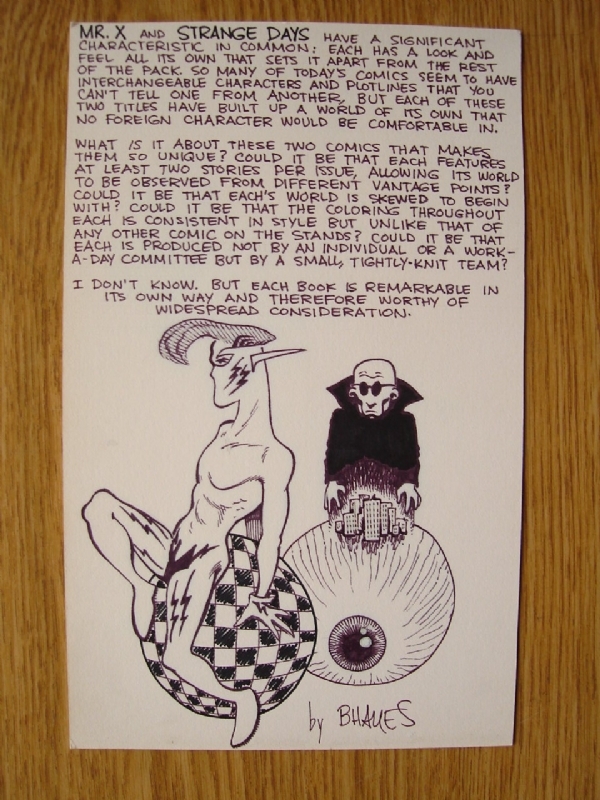 I have been enjoying the gentleman's artwork since before that and I fondly recall his work in Strange Days from Eclipse Comics in the mid 1980s. 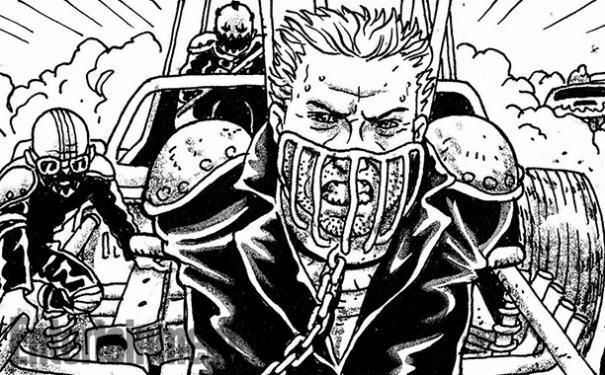 You can read more about Mr. McCarthy's involvement with Mad Max over here and here, and I'm pleased to read that a sequel to Fury Road has already been announced! In a "New York Times crossword" published last week in The Chicago Sun-Times, I noticed that one clue asked for a "DC Comics character with a whip." Catwoman, right? That's what came to my mind immediately, but it didn't fit. Only seven spaces were allowed but "Catwoman" clicks in at eight letters. That odor you smelled that day was the rusty wheels turning in my head. What other DC character has a whip and can be named in seven letters? Of course "The Whip" would fit but, honestly, nobody knows or remembers him. The Jack Kirby character Lashina (pictured above) actually uses lashes/belts and not whips so that couldn't be it either. I strongly anticipated the solution printed in the next-day paper and what I saw there was thoroughly unexpected. 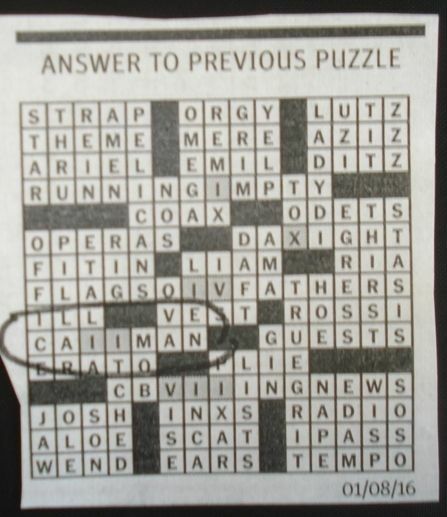 The printed solution indicated that the eight spaces should be filled with "CAIIMAN." Huh? I neglected to mention that the third and fourth of the eight allowed spaces in the original puzzle were gray-highlighted. I thought nothing of that when I was working on the puzzle because the gray-shade had no meaning to me. CATWOMAN was the correct response to the clue but three of its letters were replaced by "II." Somewhere among the other clues of this puzzle it was indicated that the gray spaces were to be filled with Roman numerals in some way. Again I say: huh? There is a silver lining to this murky cloud. The debacle presented me with the opportunity to display a Bruce Timm-inspired drawing of a Jack Kirby character! 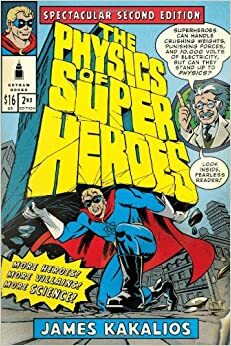 I was wondering how Supergirl on CBS would distinguish itself from the many other superhero shows currently playing on television and now I have my answer. Supergirl is the repository for visitors from other planets! Aside from Supergirl herself (from Krypton) the show also features Jemm of Saturn and The Martian Manhunter, plus Vartox of Valeron has shown up. 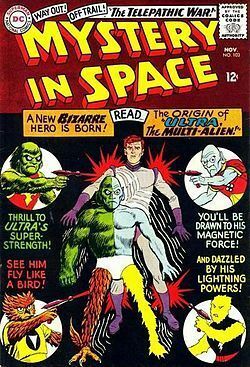 Of course I await the inevitable appearance of Ultra the Multi-Alien. And why not? 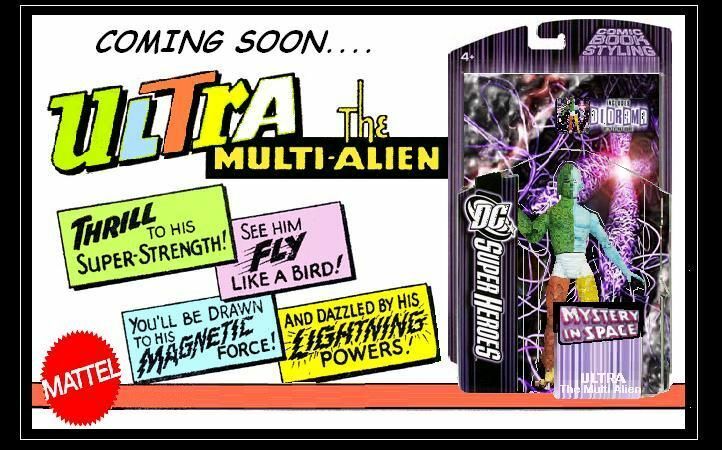 I thought I was the only one who remembered him but Ultra was judged popular enough a couple of years back to be released as an action figure! 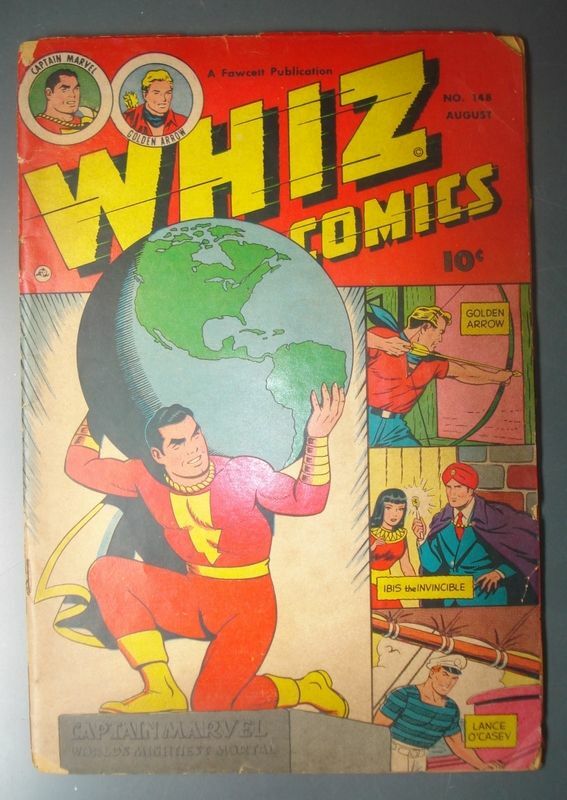 My grandmother bought Whiz Comics #148 for me when I spotted it as we strolled through a weekend afternoon Flea Market being held in the parking lot of a Drive-In Theater. 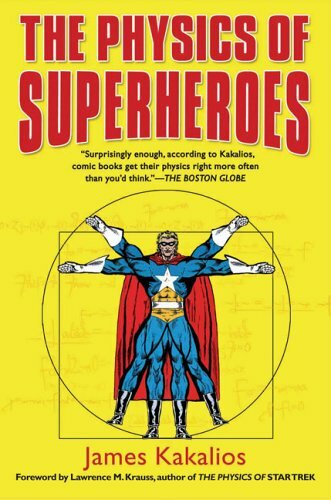 Of course I can look at the cover now and recognize the artwork instantly as the handiwork of the great Kurt Schaffenberger but at that time I did not know that gentleman's name (and to think that just a handful of years later I would be corresponding with Mr. K and commissioning him to draw a Captain Marvel for me!). Witness the birth of the hayfamzone. 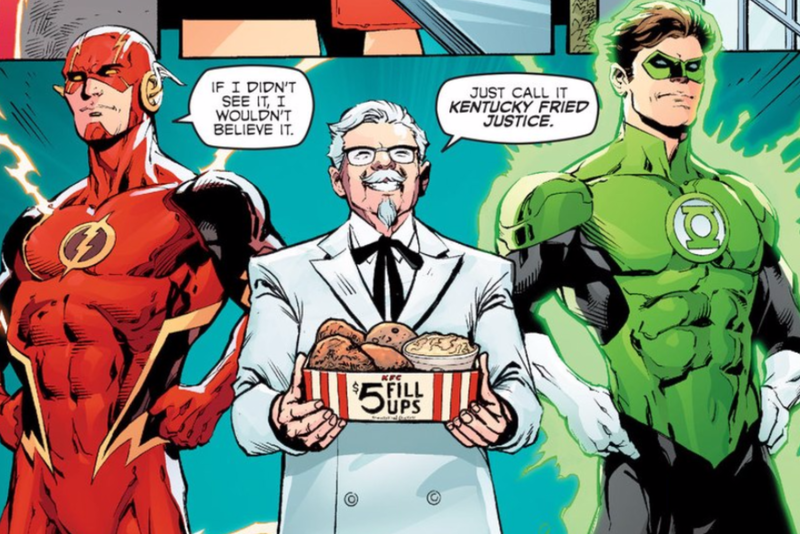 Do you know about the new comic book featuring Colonel Sanders and The Flash? 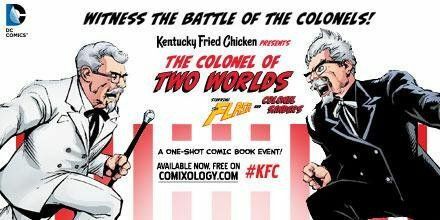 Online only and drawn by Tom Derenick, the story features not only the kindly Colonel Sanders with whom we're so familiar but also a Dark Colonel Sanders from The Crime Syndicate's Earth-3! It's trippy fun and the download is free right over here. You'll probably call it a finger-lickin' good comic!